Though war was &#8220no place for a woman,&#8221 many New York state women during the Civil War set off from their homes to nurse the sick and wounded. One of the projects sponsored by the Tompkins County Civil War Commission is to honor women from the county who went to war. The Army set regulations for nurses. They were to be women between the ages of 35 and 50- they needed to be persons of experience, good conduct, superior education, serious disposition and good health. They were to be neat, orderly, sober, industrious and be willing to travel with a small amount of luggage. Their dress was to be plain, brown, gray or black, with no ornaments. They would be paid 40 cents a day or $12 a month in addition to food, housing, and transportation. In July, Dorothea Dix called Hall and Dada, who came from Syracuse, to Washington. Dada has left a diary account of their experiences- both women served to the end of the conflict. Hall returned to New York state in the spring, her health strained- Dada remained in service until the fall of 1865. Sarah Graham Palmer, a widow of 30 with two children, left in 1862 following the great enlistment of that summer to accompany her brothers who had enlisted in the NY 109th Volunteers. She commented that it was &#8220something to brave popular opinion, something to bear the sneers of those who loved their ease better than their country’s heroes, and who could sit down in peace and comfort at home, while a soldier’s rations, and a soldier’s ten for months and years made up the sum of our luxurious life.&#8221 [Aunt Becky’s Army Life (1867), page 2.] Palmer, who became known as &#8220Aunt Becky&#8221 by the troops, returned to Ithaca in 1865 where she married and emigrated to Iowa. 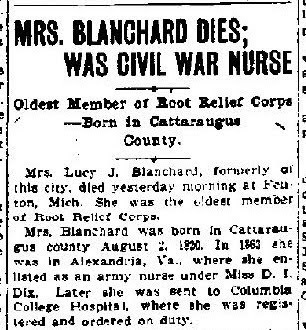 Sophronia Bucklin of Cayuga County also went to war in 1862 and served under the direction of Dix, working at a variety of military hospitals. She lived out the rest of her days in Ithaca. She too left a memoir of her experiences titled In Hospital and Camp: A Woman’s Record of Thrilling Incidents Among the Wounded in the Late War (1869). Julia Cook heard of the need for nurses in the spring of 1864. Her husband had died in the war and her son had been wounded in battle but continued with his regiment. Cook went to Washington and began nursing but she soon fell ill and was sent home to Dryden. Cook and Bucklin are buried in Tompkins County- Hall in California, Palmer in Iowa. These women were little honored in their lifetime- a flag pole was erected over Aunt Becky’s grave in DeMoines in 2009. It seems fitting that we remember them today as we commemorate the 150th anniversary of the Civil War. By action of the Tompkins County Civil War Commission and the TC3 Foundation a fund was created to honor these women and provide aid to nursing students at Tompkins Cortland Community College in Dryden, New York. These will be named for Susan Emily Hall, Julia Cook, and Sarah Graham Palmer. A faculty enrichment grant will be named for Sophronia Bucklin. Donations to the Civil War Nurses Fund have come from all around the country. Nurses came from all over the state. I have been collecting the names of women from New York who served and would be glad to post that list and add names of others to it. 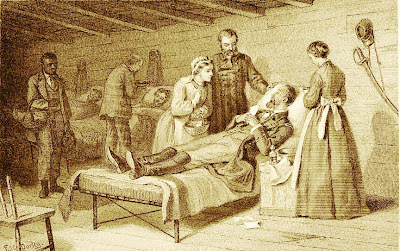 Illustration: &#8220The Dying Soldier &#8211 The Last Letter From Home&#8221 by F. O. C. Darley, as it appeared in Mary A. Livermore’s My Story of the War (1888). Carol Kammen is Tompkins County Historian, a Senior Lecturer at Cornell University, and the author of several books, including On Doing Local History: Reflections on What Local Historians Do, Why, and What It Means and The Peopling of Tompkins County: A Social History.